There has been considerable recent blog discussion of Rahmstorf smoothing and centering, with attention gradually being increasingly directed towards Rahm-sea level. Last year, these topics were discussed online by Tom Moriarty here in a posting at his blog which unfortunately did not receive as much attention as it deserved. Following recent discussion at CA, Tom posted a follow-up article here. Tom and I got in touch and, from that correspondence, I learned that Rahmstorf had commendably sent code for his sea level article to Tom, commenting that he was “the first outside person to test this code”. As we’ve learned, such testing is not a prerequisite for publication in the most eminent science journals (Science in this case) nor for use in “important” reviews, such as the Copenhagen Synthesis. I’ve placed the (Matlab) code online here. I’ve transliterated some relevant portions and placed source data online so that the emulation is turnkey. I’ll demonstrate that I’ve got the right data and have emulated things correctly. I’ll conclude this post with an interesting plot of the actual data – something that was omitted in Rahmstorf 2007. 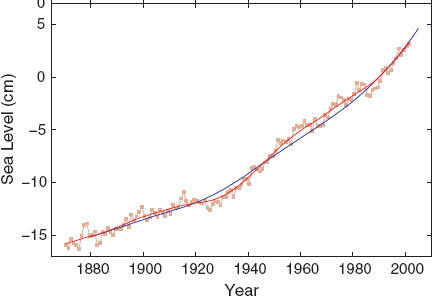 A highly significant correlation of global temperature and the rate of sea-level rise is found (r = 0.88, P = 1.6 × 10−8) (Fig. 2) with a slope of a = 3.4 mm/year per °C. These results are obtained through a simple linear regression of binned and smoothed rise against binned and smoothed temperature. No allowance is made for the reduced degrees of freedom for autocorrelation. (After making such an allowance, needless to say, there are virtually no degrees of freedom left.) R07 illustrated this regression through his Figure 2, emulated below. This “relationship” is used throughout the article. Next here is an emulation of the top panel of R07 Figure 3, showing the smoothed rate of sea level rise against the fit from the smoothed GISS temperatures. (Actually and this is something that may surprise readers – the red curve has been rahm-smoothed twice!) I’ll show some further information on this “relationship” below. Figure 2. Emulation of R07 Figure 3 top panel. Figure 3. Emulation of R07 Figure 3 bottom panel. Rahmstorf then takes various IPCC projections and uses the R07 “relationship” between temperature and sea level to project sea level. Figure 4. Emulation of R07 Figure 4. Something that isn’t actually shown is R07 is a plot of the data, an omission which is remedied below. To me, these curves look like they have very little relationship. But if you’re a Copenhagen Synthesizer or a Science reader, this relationship is, I guess, 99.99999% significant. What happens when the Rahmstorf relationship is adjusted for autocorrelation, along the lines of the Steig corrigendum (or the Santer, Schmidt 2008 critique of Douglass et al 2007). There are only 24 bins. The AR1 autocorrelation of residuals is 0.75, resulting in N_eff of 3,36 (using N_eff=N*(1-r)/(1+r) ). Instead of a rahm-significant relationship as claimed, the confidence intervals are: 0.34 0.47 (not significant at all). Having said that, it makes sense to me that higher temperatures would result in higher sea levels. 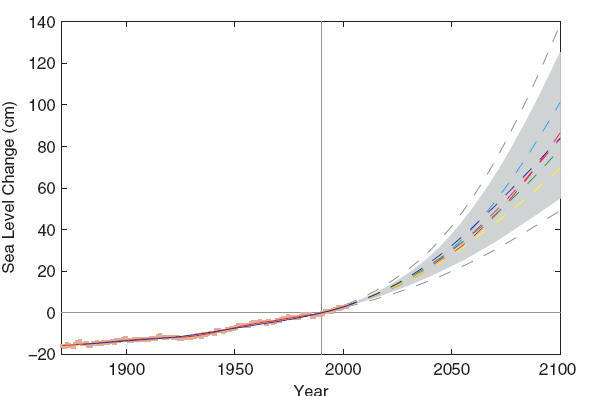 I think that a heuristic diagram comparing the total sea level rise to the total increase in temperature in the historical period would probably make some sense. It’s Rahmstorf’s effort to dress a heuristic relationship in the language of statistics that fails so miserably. With the recent Steig precedent on the need to issue a corrigendum for failing to allow for autocorrelation, Rahmstorf really needs to do a similar corrigendum. It’s pretty hard to keep up with Team corrigenda. This entry was written by Stephen McIntyre, posted on Aug 7, 2009 at 4:26 PM, filed under Sea Level Rise. Bookmark the permalink. Follow any comments here with the RSS feed for this post. Both comments and trackbacks are currently closed. Could you perchance plot up the unsmoothed, unbinned temp vs sea level change? I’m curious how it compares to the Rahmplot. Re: Earle Williams (#1), Yes, I think that could make it even clearer, but what Steve has displayed here is scientifically chilling and pretty obvious. It seems to me that it is is more than likely that they’ve played with these figures until they got a way to make the figures “fit” better, while forgetting about autocorrelation. Hard to believe, but it does seem to be the obvious explanation for these bizarre “relationships”. Copenhagen, here we come with the “relationship”! Re: Earle Williams (#1), I agree. Derivatives aren’t data. Derivatives are the crumbs you feed the birds after you’ve eaten the toast. Rahmstorf did the best anyone could do with the dh/dt numbers. He’s looking for a relationship that may likely be there, but can’t be teased out of what he started with. Am I correct to say that this is an exmple of incorrect undergraduate statistics? I doubt that an undergraduate statistics student would do something as bad as this. You need to be a “professional” to do something like this. So the claimed trend isn’t significant when autocorrelation is taken into account. What’s new? Its Team Quality analysis. 1. If Rahmsdorf does issues a corrigendum he will not give any mention to Steve McIntyre. 2. He will claim that the reanalysis in no way invalidates the conclusions. It would make sense to me that the sea-levels would be a lagged response to temperature rise because of the latent heat of fusion of water. But I’m still baffled as to how to calibrate a global temperature to any particular proxy. If you are going to calibrate a near surface global temperature to anything, I would expect it to be Ocean Heat Content. But even that would have time lags. Elegant and devastating – as usual. Would a scatter plot of – akin to Figure 2 – of the actual data shown in your two trend charts show the impact of the binning and smoothing? In my minds eye I see many of the points in Figure 2 being “blown apart” across the entire space. Don’t let William M. Briggs read this post. There will be brain matter everywhere. I think William Briggs will feel aggrieved that climate scientists are making basic statistical mistakes which aren’t being picked up by peer review. On the other hand, they do make Steve McIntyre look like a statistics god. In figure 2, the left panel shows the final “Rate of Change” of about 3.5 mm/year. But the right panel shows the final “Rate of Rise” of about 0.35 mm/year. The scale of the right panel needs to be changed, or change the vertical axis label to cm/year. Yes, the cm and mm need to be tidied up. But surely people can cope with that in a blog post. It is excellent that Rahmstorf has provided his code. It is a pity that it has been pulled to bits so thoroughly, as it will not encourage him to provide more in future. Shades of Phil Jones’ (in)famous comment. How can the climate ‘insiders’ be encouraged to see CA as a constructive exercise? Maybe it’ll entice him to do appropriate analyses and not submit nonsense for publication? Maybe it’ll entice the so-called scientific journals to do appropriate peer reviews? He made the claims and they don’t hold up to scrutiny—that’s what science is all about. I am not sure I get your point. If Rahmstorf’s findings and methods had been more robust then the paper would not have beeen pulled apart so readily. The provision of the data and code should be sine qua non for all papers. I do not think their use to rigorously test the findings of a paper should be a consideration. (Rahmstorf) was one of the lead authors of the IPCC Fourth Assessment Report. In 1999 Rahmstorf was awarded the $1 million Centennial Fellowship Award of the US-based James S. McDonnell Foundation. Rahmstorf is a member of the Panel on Abrupt Climate Change and of the German Advisory Council on Global Change (WBGU). Excellent work again. So, what are the next steps? Inform Rahmstorf of the need for a corrigendum? Inform ‘Science’ of the need for a corrigendum? Before the mystery G-man informs them? The temperature data in figure 4 shows its highest annomaly post 2000. I have not seen this on any other recent temperature series. Could you please tell us the source of the temp data used in figure 4. Re: MattA (#19), McIntyre mentions “GISS” in the blog post, and the data as graphed looks a lot like the GISS graph. How can the climate ‘insiders’ be encouraged to see CA as a constructive exercise? They would first have to abandon some core beliefs, namely that the science is settled, and that no rational informed dissent is possible to the core AGW hypothesis, and that no work by any core member of the movement is an appropriate target for criticism. We now have yet another test case: does the team repudiate and retract in the face of this devastating critique? One would predict no, it will engage in obfuscation and last ditch defense. It will be entertaining to watch the contortions over on tamino. The contortions over PCA, and the entry of Joliffe, were a delight. This one should be even better. Steve: I have never expressed any view on the “big picture”. Nor does this stand or fall on any individual papers. Nor have I purported to prove the opposite. Also “99.99% statistically significant” is not the only relevant metric for decision-making. That there is a relationship between sea level and temperature seems entirely reasonable to me. Don’t hold your breath if you expect Rahmstorf to acknowledge the error, give a polite thank you and write up a corrigendum. But you’re welcome to speculate yourself on how he might react. William Briggs has a relevant post here. I love your term: “rahm-smooths”, especially since Rahm is the German word for dairy cream. Sounds good enough to eat. Mahlzeit. Another surprising example of consensus. Actually, the team seems to be more interested in being the master of the statistics rather than acquiring a mastery of the subject. Perhaps we could call what they do “Humpty Dumpty statistics” after the character whose innovative use of words was so robust. One of my all time favorite quotations. Could the time periods possibly reflect changes in measuremnt methods? Other climatic or geophysical shifts? It is interesting that in a critique of John McLean et al’s paper on the Southern Oscillation Index and world temperature, by Foster, Jones, Mann, Schmidt and 5 others, (in press) it is claimed that you can’t do an analysis with rates (or change from year to year), because rates are not real. The rates in question are changes in world temperature from one year to the next, which is exactly what a yearly sea level rise is. Do these guys need to have a conference call to get their story straight? What struck me more was not the rate of change of sea level, but that it appears to be measured against the anomaly temperature. I can see making a statement along the lines of “the temperature went up by 0.1C and that led to an increase in sea level of .2mm.” But I cannot see a statement “the temperature was .5C above the 1950-1980 anomaly and the rate of change was .2mm” for exactly the reason that you state. Does that make sense? That said, I still find the clustering of the rates of change in sea level in Figure 2 odd – the more so when you attach the binned time period for each of the data points. Sorry about the goof at 31. Do you know why ducks have flat feet? From stamping out forest fires. Do you know why elephants have flat feet? From stamping out burning ducks! I would like very much like to see a mechanism that did not violate basic thermodynamics that would allow ocean heat content and ocean thermal expansion to be uncorrelated. I’m not holding my breath. The magnitude of the lag between atmospheric temperature and upper ocean heat content is very much a bone of contention at present.